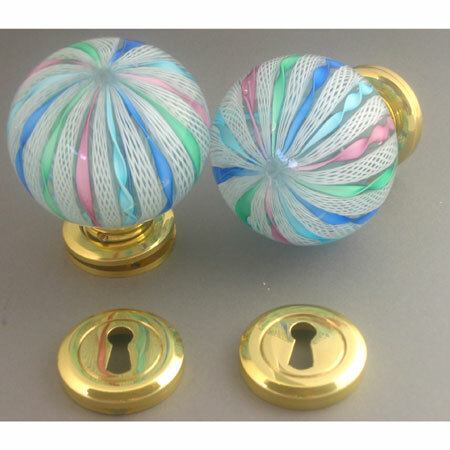 Enrich your home with handmade Venetian Murano Glass Doorknobs. Matching interior and exterior knobs of crystal clear glass with colorful canes worked into a ribbon pattern. Size is approximately 7 cm (about 2.8 inches in diameter). Decorative keyhole covering and knob to knob connecting shaft for doors knobs are also included. Installation/modifications required for some doors. The doorknobs are made for use in the European thick wooden doors, but are readily adaptable to American doors by correctly modifying or replacing the through-door-locking unit shaft. For exact installation assistance in your door, consult a local door installation service organization.